Kabobs are a sneaky meal. They seem easy enough and people default to them a lot during the summer. After all, how hard is it to throw some stuff on some sticks and grill it? But there’s definitely some things that can wrong in Kabobland if you aren’t careful. 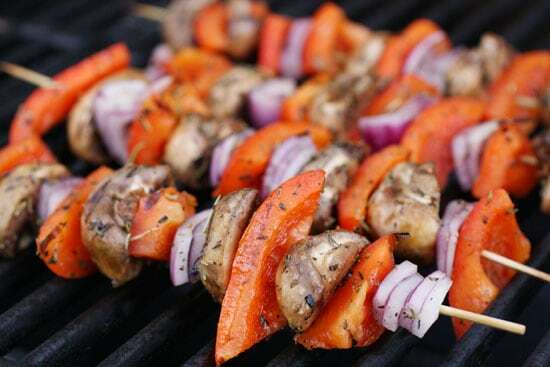 For starters, if you’re using wooden skewers, you run the risk of scorching them so badly that they fall apart. Meanwhile, it’s pretty easy to overcook or under-cook whatever it is your cooking: veggies or meat. What this means is that while kabobs sound simple, a lot of times you’ll end up with dry pieces of chicken or soggy veggies falling off of skewers that are burnt to a crisp. But it doesn’t have to be this way obviously. There’s a surefire way to make great kabobs that’s stress free and relatively quick. So let’s get to it! Chicken and veggie kabobs marinated and grilled. Served with a dill yogurt sauce and rice. A great Spring/Summer dish! 1) To prep the yogurt sauce, just mince all the ingredients and combine them. The flavors will get more intense as it sits. Refrigerate until needed. 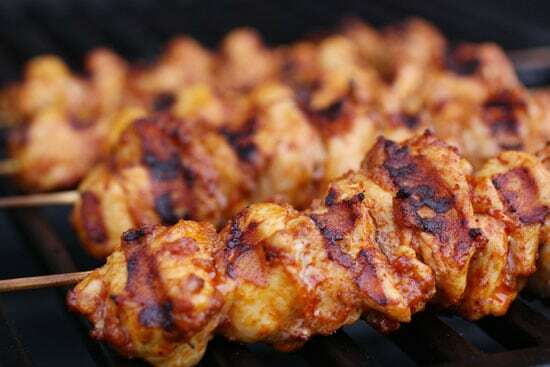 2) Be sure to soak your skewers for at least 30 minutes before using them. 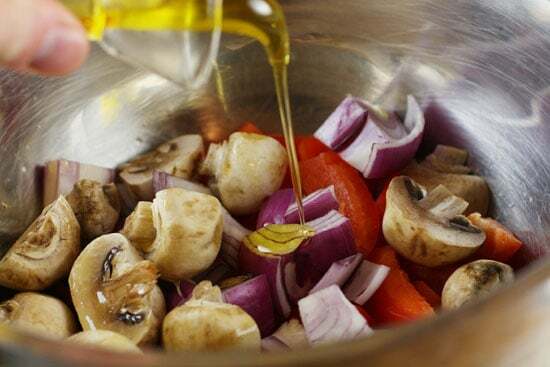 3) To prep veggie kabobs, cut veggies into chunks and marinate with olive oil and spices. 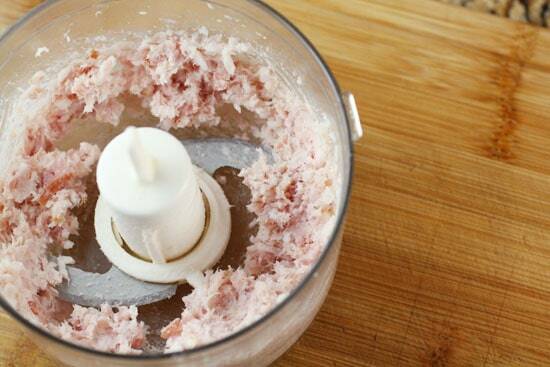 4) To prep chicken kabobs, mince bacon slices in a food processor until they form a rough paste. 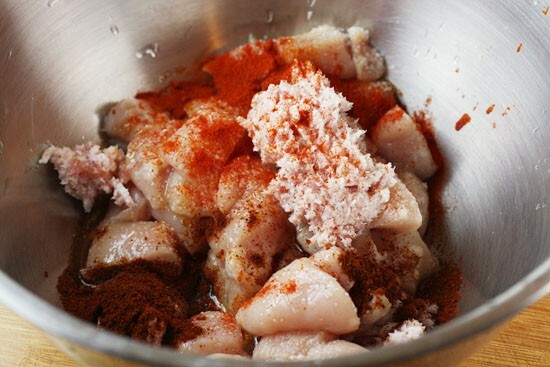 5) Combine bacon with spices and chicken pieces and stir to combine well. 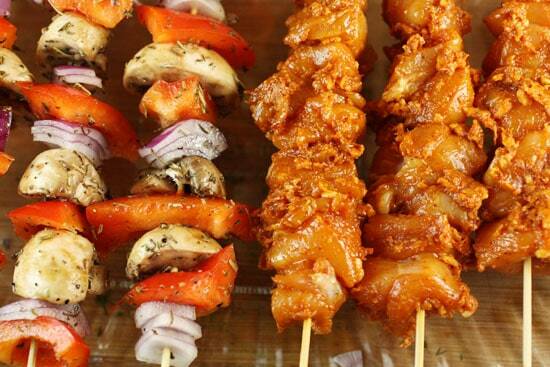 6) Skewer veggies and chicken separate. 7) Grill on high heat. Chicken kababs will probably take 15 minutes. Veggies will take more like 10. 8) Serve with yogurt sauce and rice! If you’re using wooden skewers, the first thing you need to do is make sure you soak them really well. Honestly, if I can I try to soak mine overnight or early in the day just so they have plenty of time to get really wet. If you soak them for 10 minutes, you’re not going to really accomplish much because all of that water will evaporate immediately once they are on the grill. Meanwhile, the veggie kabobs are pretty easy to prepare. Just cut them all into pretty large pieces and then give them a good drizzle of olive oil. I added a good amount of Herbs de Provence to my veggies which works well on the grill I think. You could use any seasonings that you want or just keep it simple with salt and pepper. The key is to keep the pieces pretty large so the veggies don’t get soggy or overcooked. For the chicken kabobs, I read a fascinating prep method in last month’s Cooks Illustrated that I decided to try out. To beat the issue of having dried out chicken, they suggested coating all the chicken pieces in processed bacon! It’s kind of weird, but it totally works. Just take a few slices of bacon and buzz it up in your food processor! Mix the bacon in with your cubed chicken and some paprika and chili powder for a little kick! When you’re ready to skewer your kabobs, I highly recommend doing all chicken ones and all veggie ones. Some people might disagree, but I find that if I mix the chicken and veggies together then it’s hard to cook them both to the right doneness. Either the chicken is undercooked or the veggies are soggy. So I just split mine up and it solves the problem. You could just serve these over rice, but I decided to make a quick (and I do mean quick) yogurt sauce for the kabobs. 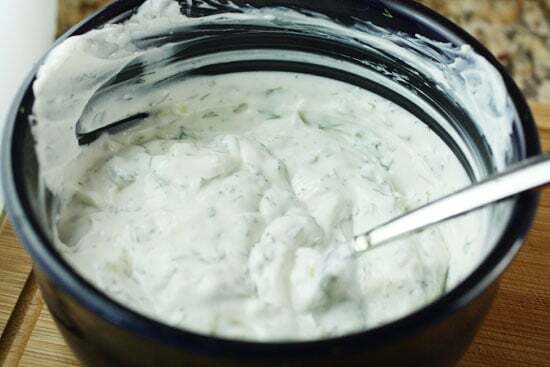 It just greek yogurt, lemon juice, garlic, and some fresh dill all mixed up. It’s very quick to make and tastes great on everything. Once you’re ready to grill, crank up the heat to high. When the grill is hot add the the kabobs! The chicken ones will need probably 15 minutes, turning every five minutes or so. As they cook the bacon keeps them really moist. It’s genius really. Meanwhile, the veggies will probably only need 10 minutes, but that depends on what you use and how big your pieces are. I like mine to be a tiny bit crispy still. 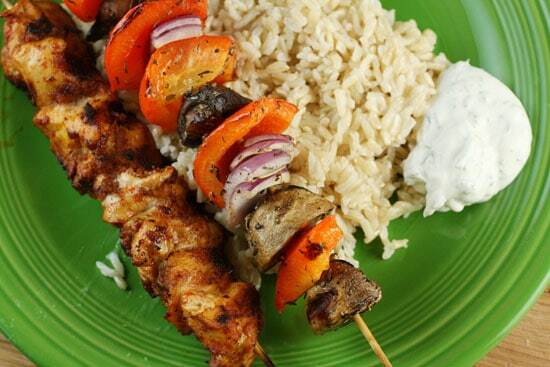 A skewer of chicken and a skewer of veggies with some rice and yogurt sauce is a really solid meal! Kabobs can be easy, but they can be hard to perfect. The bacon tip is a great one and I highly recommend cooking the veggies and meat separately as well. 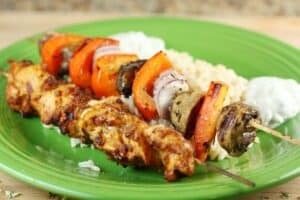 If you have any kabob tips, leave a comment! I agree on separating veggies & meat. We do the same. I have what may be a stupid question: "processed" bacon? What does that mean? I like the sound of the bacon on these Kebabs! I like the bacon idea for a switchup, but if you don't want the extra calories or the different flavor, brining the chicken breasts pre-grill has never, ever failed me. I slap a brine together with loads of kosher salt, brown sugar and a bit of crystallized ginger , a few peppercorns and dried bay leaves diluted in 4-6 cups hot water, sliced (whatever is about to go bad) citrus and loads of ice in a gallon baggie with whatever chicken (or pork) you're grilling fully submerged for a few hours… Not once (in hundreds, possibly thousands) of grilling sessions has the meat been dry. I use the same brine (or variation) for oven-roasting chicken and pork — espeically Thanksgiving turkeys. I saw this bacon technique in CI, and I have been wanting to try it. Now that you have "tested" it for me, and I definately going to make it! Tonight, in fact! Thanks, Nick! Did you coat the chicken with oil – or does the bacon serve that role??? There is a tiny amount of olive oil (1 tablespoon). The bacon does a good job of keeping them moist and not sticking to the grill though.